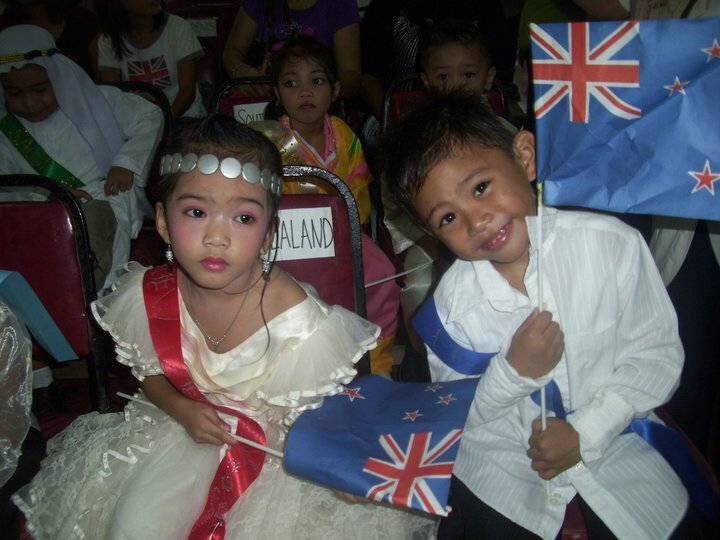 Boracay Alive | On The Rock Ministries..
Every year our school, AGAPE BORACAY ACADEMY, celebrates All Nations Day. Each class represents a different continent. Their costumes and presentations are unique to their culture. 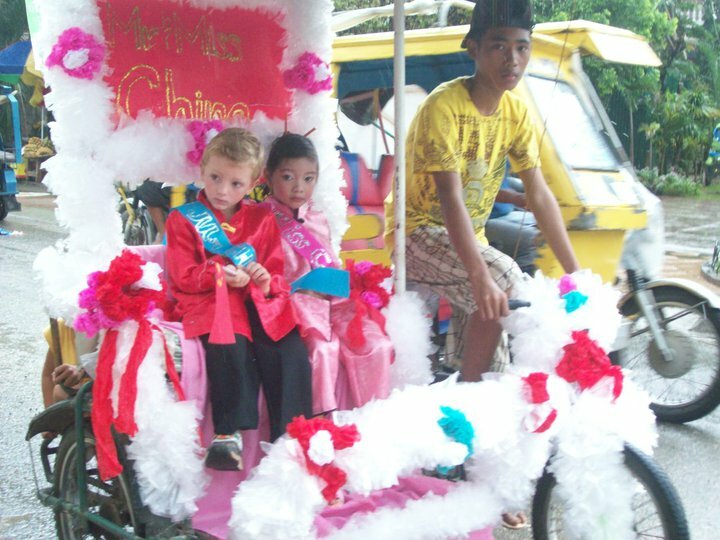 It begins with a parade down the main street of Boracay. Over 170 children plus parents and teachers. After the parade we gather at Faith Village where each class gives a presentation. 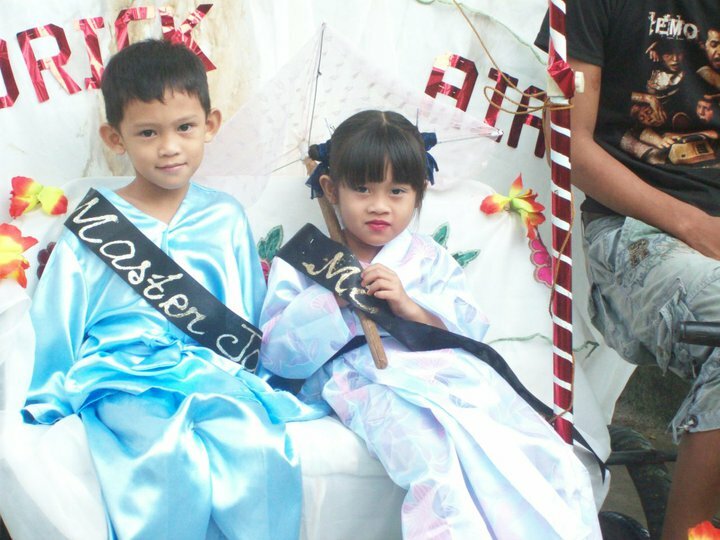 It is a wonderful opportunity for the children to be able to showcase their talent. The Kinder Two class singing “Jesus Loves the Little Children.” They represented Australia. 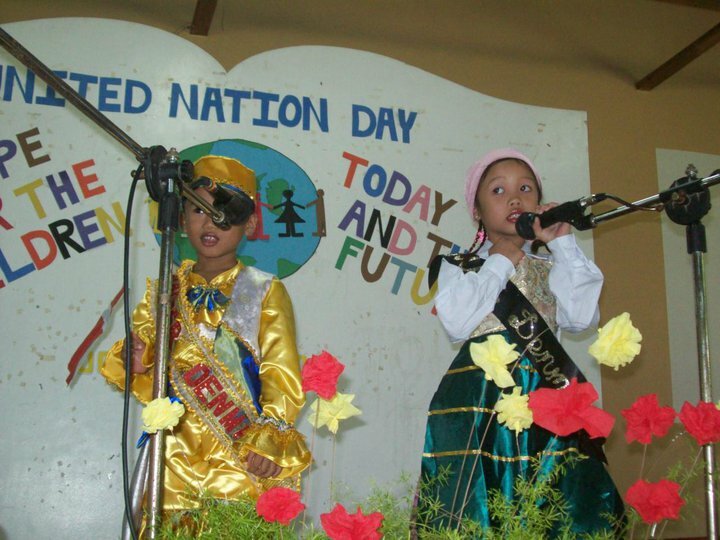 Grade Six represented the United States. They danced a traditional Hawaiian dance choreographed by their teacher who is from Hawaii! One of our volunteer teachers, Liz, with some of her students after the performance. All of the children work so hard leading up to the big day, but so do our amazing teachers! We are so thankful to God for the staff He has blessed us with! If parents and students did not previously know the meaning of The Great Commission, they know now the significance of this biblical directive. The slogan for our school is . . .
We are encouraged that out of these students, God will raise up Christian leaders out of poverty, to take the Gospel into their communities, nation and the world. 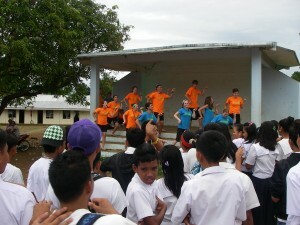 The students formed a parade down the main street and beach front of Boracay. The parents and staff did a wonderful job arising to the occasion. Eventhough so many of these children come from homes in poverty, it is fantastic to see what God can do through their skills and lives when given the opportunity. Each individual student gave a short speech about the country he/she represented. How wonderful it was to hear each of them speak English so well! We praise God for our wonderful staff and volunteer tutors who have given these children the opportunity to learn English with excellence. Miss Nigeria speaks with expression! *A Special thanks to Richel Sales for taking such great photos! 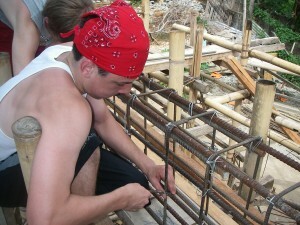 God has blessed with the construction of the Community/Ministry Center on Boracay Island. 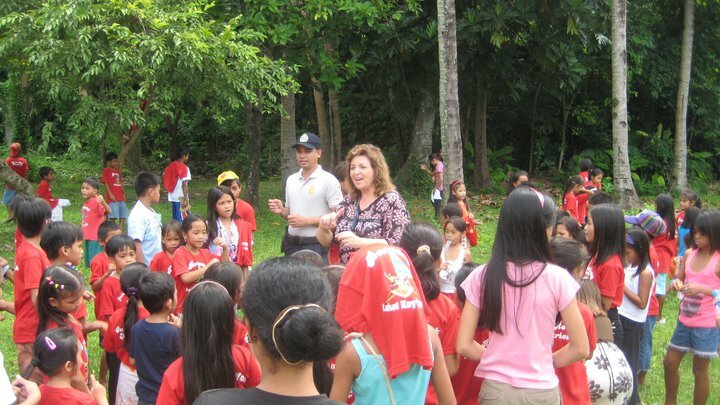 Through the efforts and support of Nieva Mendoza, she has recruited the Philippine Army to help in the construction. 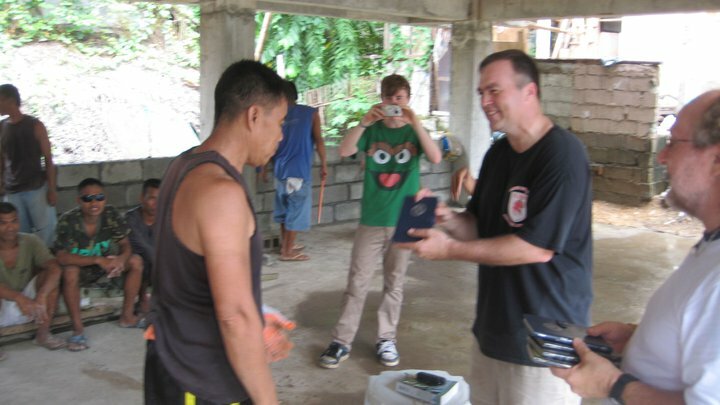 Rick Holden, a sargeant of the US Air Force was able to give out Bibles and Pastor Rolando and others have been able to share God’s love and the message of salvation. 1. 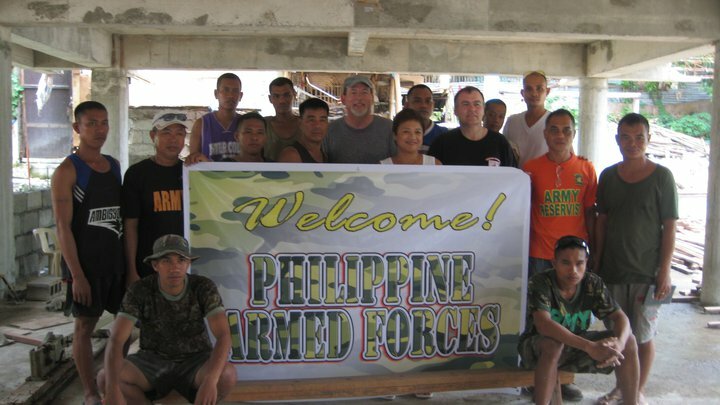 The Philippine Army helps to build the Boracay Community Center. 2. Rick Holden, US Air Force Sergeant from Guam and a soldier from the Philippine Army work together. Twenty-five adults are signed up for the first class. Please pray with us for these students, as we see God bring our original vision to fruition, as part of God’s ministry here on Boracay. 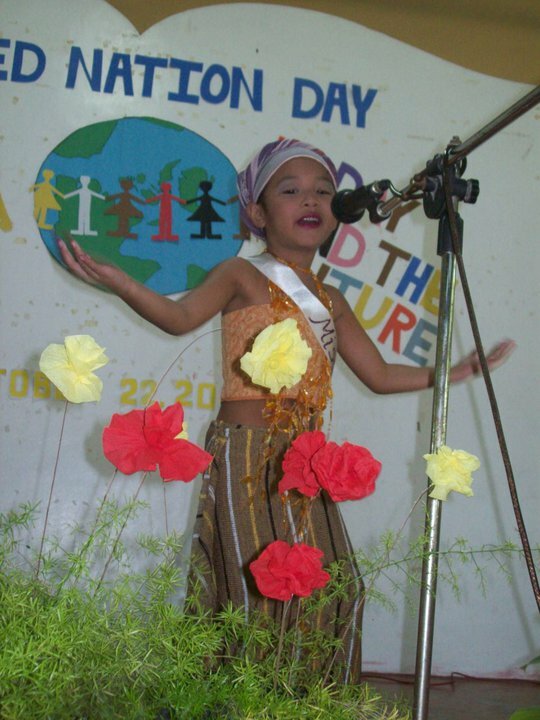 The students are from Boracay and will also be coming from all over the island of Panay. Marivic wondered if she was about to die. Because of her weakening sickness, she was making a last resort effort to do what seemed to be a good thing. She had heard there was to be visitors from Hawaii attending Church on the Rock and perhaps the special service would be of spiritual help to her. So together with her friend they attended the church service on Sunday morning, Oct. 10, 2010. It is Marivic’s life leading up to Oct. 10 that makes her story surprising. Several years ago, Marivic had been shunned and rejected by her mother. As a child she had been physically abused by her step father. Because of this, Marivic had questioned her mother, asking why she would have a relationship with this kind of a horrible man. Marivic’s questioning led her mother to take sides with her husband, Marivic’s step father. To make matters worse, Marivic’s husband had abandoned her and her 8 year old boy. With all of this sadness, sickness and heartache in her life, it seemed too much to bear, and yet Marivic still had not responded to a message of hope; to the outreach ministry and bible study going on at Alta Vista where she was living. Jessica, one of our ministry workers had tried to minister to her for months, but Marivic resisted Jessica’s spiritual prodding and counsel. Marivic also had no interest in the regular Bible study, yet it was Jessica’s continual gentle nudging, love and care that finally lead Marivic to ask Jessica to pray for her when she became very sick and could hardly breathe. She had finally come to a point of desperation and hopelessness, and asked Jessica for prayer. This was also the time that she came to church on Oct. 10. As she sat in her chair during the service, the Holy Spirit began to speak to her. She especially was blessed by the praise music. Even in her desperate breathing condition, she felt such peace. In her heart and mind, she cried out to the Lord saying, “God if this is the time I will die, then I am ready.” Marivic felt God hugging her as she prayed. As she told God she was ready to die, she also said, “…. but God, if you have a plan for my life, heal me from this sickness!” As she stood during the praise and worship, she became faint and asked her friend to take her outside. She lay on the grass outside the church building, when others gathered around to help. Dan and Jessica gathered her up and took her to the clinic. This began a time of physical healing through the medical financial help from the ministry and visitors from Hawaii. 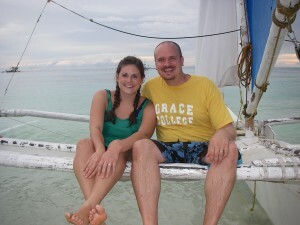 Dan said, “We took her to the Baptist Hospital in Caticlan where she received medical care. As she lay there in the emergency room, she began to pour out her heart to me.” Then Teresa showed up to comfort and pray with her. In the culmination of her desperate condition and overwhelmed with others’ love, it was there in the emergency room that Marivic prayed to receive Christ as her Savior. Marivic stayed in the hospital for 6 days while 2 liters of fluid was removed from her lung. Marivic is now under medication and medical observation. Through her ordeal, she has found spiritual healing, as have many on Boracay through On the Rock Ministries, but God is not just touching lives spiritually, but He is restoring lives physically and in the spiritual and physical healings, God is restoring hope in people. Now that Marivic is out of the hospital, she is now back at Alta Vista. She does not have a house, but she is living in the Ministry Feeding Shelter at Alta Vista. It is Girly and Violi, the caretakers of the shelter who are helping her and caring for her along with some others in that little village. To many it may seem odd that Girly and others at Alta Vista now feel compelled to love and care for Marivic, but they feel compassion for her because they too have received love and compassion. It is the same love and compassion from Jesus shown through Jessica and other ministry workers shared from the beginning, when they first set foot in Alta vista to minister to the people there. Please continue to pray for Marivic’s spiritual growth and others who the Lord is reaching on this island. This is just one true story out of many stories continually taking place within the depressed communities on the island of Boracay. Learning the ‘Finger Verse’ in Sunday School. We continue to Praise the Lord for your prayers and gifts which are vital to this ministry. As the ministry grows, the needs increase. 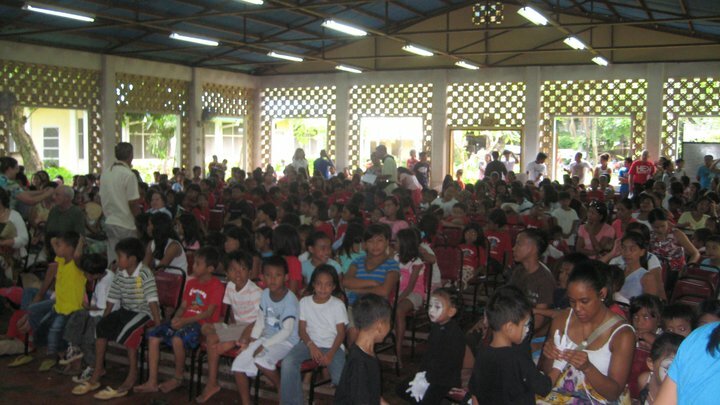 If God would touch your heart to help and get more involved, please write to us at beaverbalita_seasia@yahoo.com. 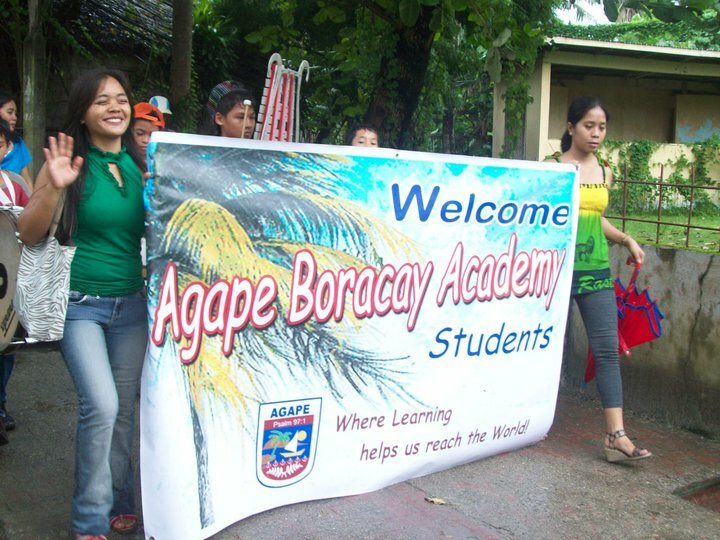 We continue to pray for teachers to volunteer at Agape Boracay Academy. Perhaps you know someone who might come for even a semester or two. Community Relations officers on Boracay are instructed to keep the peace by keeping an eye on what’s happening with the locals and tourist. Their duty is to stand by at gatherings and events. Dressed in “Bay Watch” beach-cop attire, by their appearance you would think they come right off the beaches of Malibu. Chistopher and Ryan are a two-man cop team on the island. When Boracay law enforcement realized there were so many of the ministry feedings going on throughout the island, Christopher and Ryan were dispatched to make sure peace was kept at these gatherings. As Chris and Ryan watched the love and compassion poured out to the children and parents at the feedings, they wondered why Jessica and the other Filipinos were giving and sharing so passionately with the children, parents, drunkards, sick and hurting people of Boracay. And why were these foreign visitors from America, Korea, Taiwan and Hong Kong coming back time after time to these scheduled feedings all over the island to help these poor people? Wouldn’t they rather spend their time on the beautiful pristine beaches of Boracay? As their duty called, Chris and Ryan have been going to the various feedings for quite some time now to make sure there is crowd control. In fact, their duty for crowd control has taken on more than they imagined. It is quite a surprise to see these men in uniform dishing up food and helping to organize these weekly events. In their earnest desire to keep peace, God had another plan. As Chris and Ryan were there to control the scene, God began to take control of their hearts. Little did Chris and Ryan know, that the spirit of God would take charge of their lives. As the two men were being transformed by the Spirit, they became curious and compelled to go to church and investigate what else these people at On the Rock Ministries were doing. At the church service one Sunday, Pastor Rolando gave a challenge at church. Chris and Ryan came forward that morning. Once again, God touched their minds and hearts that morning. Chris and Ryan took off their guns from around their waste and symbolically laid them down in submission to God. That morning they accepted Jesus into their lives. Now they have found out for themselves what it is to claim forgiveness through the blood of Christ. Through the conscientious efforts of Chris and Ryan serving in the community and their help at the feedings, others have noticed their earnest commitment. Recently these two cops were promoted and awarded the ‘Active Community Program Award’, a distinguished award given for the entire province of Aklan. What a joy it is to see these officers going to church and testifying of what God has done in their lives. Last Sunday, they stood in front of the congregation and testified, “By serving others at the feedings, it is no longer a job, but a part of our service to God, because through serving the community, God has saved us! 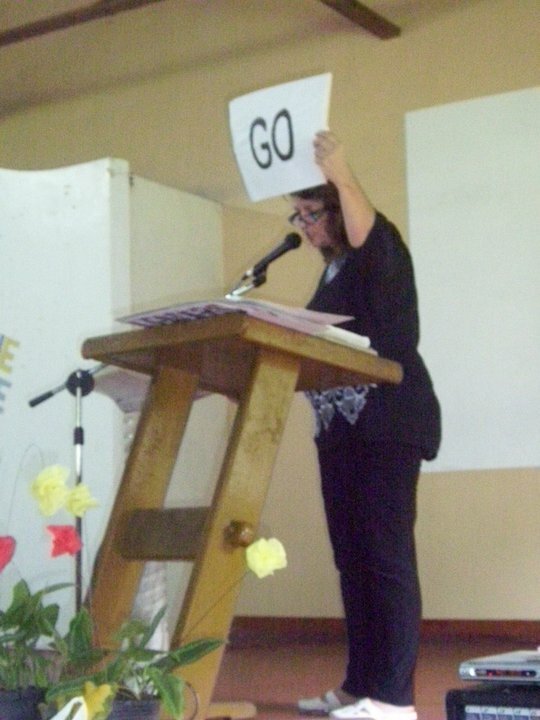 Tours the Philippines with Energy and the Salvation Message! 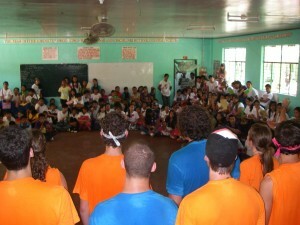 A team of 20 vibrant young Americans have brought love and the glad news of Christ to so many Filipinos. 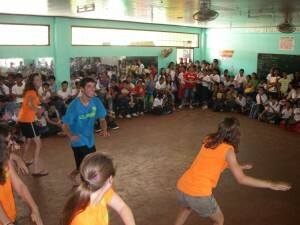 From loving, feeding and caring for impoverished children, individually leading Filipino children and teens to a personal relationship in Christ; to impacting scores of people through song, dance and drama, the OBI students have certainly made an impact for eternity in the lives of thousands of people here. We praise God for the everlasting victories that He has made through the lives of these talented and dedicated young people. After 12 days on Boracay Island, OBI performed and shared at the Marikina Grace Church. Later that afternoon, they ministered to a combined group at a special service of the Greater Manila Grace Church and its two satellite churches. During this special service on the 4th of July, 25 people were set free for eternity with decisions for Christ! 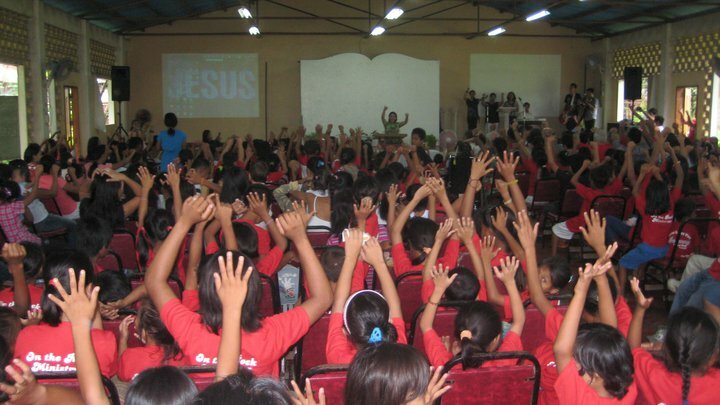 OBI Captivates Manila Schools – Shining for Jesus! The OBI Philippine team wrapped up their 17 day Philippine tour by visiting the “largest” high school in the world, Rizal High School, in Pasig Metro Manila. 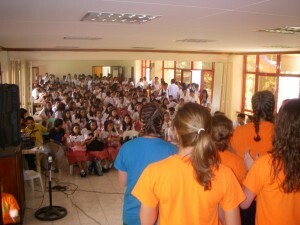 Twenty-five thousand (25,000) students attend this school and OBI was allowed to share the Gospel in music, pantomime and drama with Filipino students, ages 12 – 16. Following the hour long program by the OBI team, close to 300 Rizal students responded when the invitation to come forward for prayer and to make a decision for Christ! The day before, close to half of the 250 Jasms High School students gave the same response showing how effective OBI students were in the schools during their Philippine ministry tour. Now that Philippine schools are aware of this type of program OBI can offer their students….there will be open doors, if and when OBI decides to return again. Thank you for praying for the OBI team. They had a tremendous impact during their 17 day visit to the Philippines. To God be the glory for the great things He has done! The Lord Reigns, Let the Earth Rejoice; Let the Many Islands be Glad! No doubt the OBI 2010 team has been mighty for Jesus! 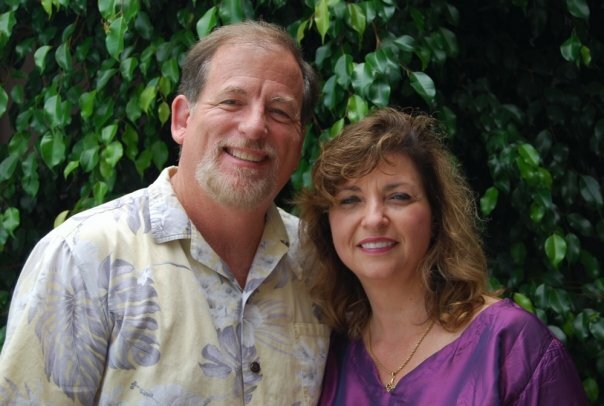 We are grateful for David and Carly Nicodemus and their wonderful leadership of the OBI team. We are forever blessed by the ministry of this team to help the work of the Great Commission in Manila and Boracay Island. Lourdes was unwilling to give here life to Christ, even though her husband, Noel had found new hope in a caring Savior. 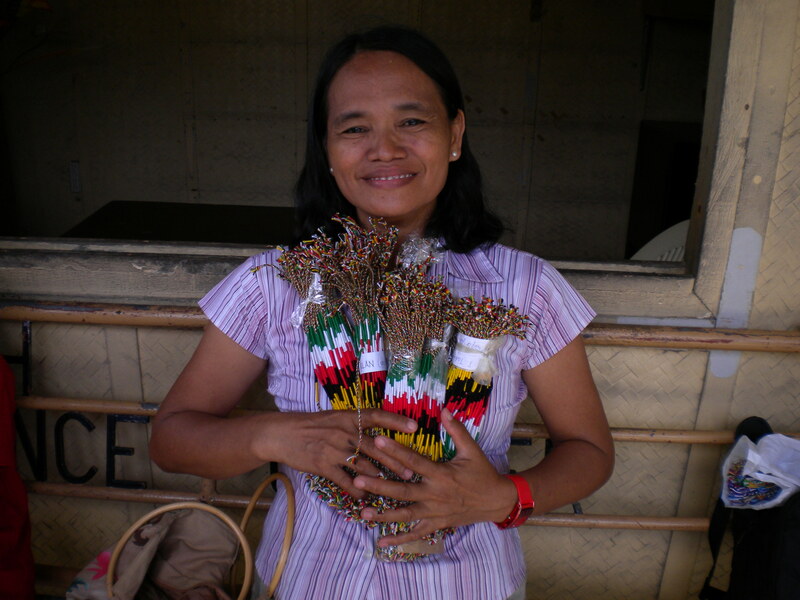 During the Bible study times held at their home, Lourdes would tend to her small variety store instead of closing it for a couple of hours to attend the bible study and fellowship. Lourdes was also pregnant and it seemed that the little active life within her womb was reason enough to be happy and content. It was the hope of a new baby, she thought, that would bring all the happiness she needed. Before the death of her baby, Lourdes thought the passion of her husband to learn about the Bible was just ‘religion’. Now she knows that it is not just “religion”, but a personal “relationship” with a loving caring savior. With the help and example of her husband, Noel and Lourdes have been an influence to see many of their extended family come to Christ. Not only do they all attend church on Sunday, but the Bible study as well. 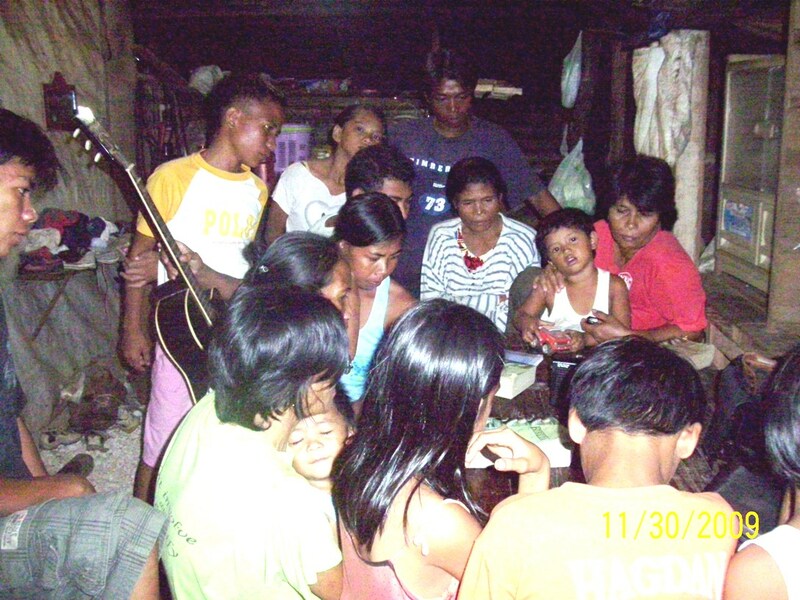 Noel and Lourdes are now also sponsoring the food every week for two feeding sites in Yapak. Many children at the Yapak feeding sites are getting a nutritious meal, hearing and memorizing God’s Word and the salvation message through the efforts of Noel and Lourdes. Today, Lourdes’s grocery and variety store is a successful enterprise. The Sunday closing of the store is a tremendous testimony to the community that it serves. Every Sunday, Noel loads up his three tricycles that he uses as a taxi service and hauls 18 adults and 12 children to church. God used tragedy and turned it into blessing. In a very unusual way, God brought many unto Himself. Dear Praying Friends for the Children of Boracay, Recently there have been those who have felt lead to send bottles of vitamins for the children that the ministry feeds every week on Boracay. It seems more and more people are touched with this burden to give vitamins! But, to tell you the truth, at this very moment we have a warehouse full of vitamins. The vitamin store house is full and over flowing! We agree! The vitamins are such a wonderful blessing for the children. It’s comforting to know that these little ones are getting something that will help their malnourished bodies to physically grow and develop in a better way. 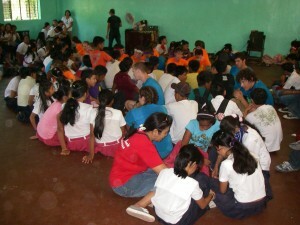 On the other hand, these children also need something to help their minds. They need education! If you are one of those who are thinking about giving vitamins, could you instead at this time give them education for their minds? Help us give these children an effective education and a chance to make a difference in their world and stop the continuance of poverty and starvation in their personal family circles and then beyond through the generations to reach the world for Christ. Now then, maybe education doesn’t come in a bottle like vitamins do, but in order to educate these little ones, they need a school building. We have vitamins, but we don’t have all the walls to develop their minds. 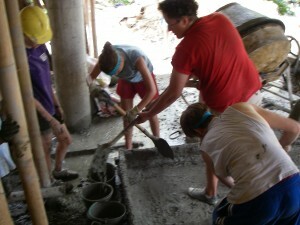 Would you be willing to give some bags of cement, sand or gravel to help their minds? Could you donate 10 bags, 20 bags or 50 bags or more? Perhaps you could donate some of the building blocks; each one representing one child that will pass through the halls of the school. Will you join with us, in the hope and vision to raise-up Christian leaders out of poverty? Without education for these children this hope and vision is lost. 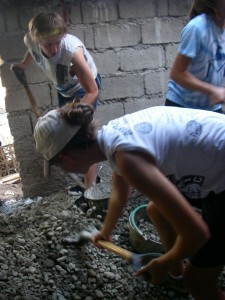 A bag of cement is $5, a sack of sand or gravel is about $1 to $2, and a building block is just 38 cents. 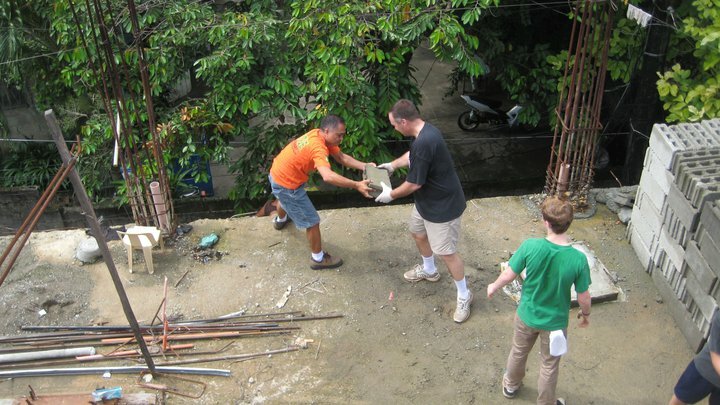 The on going construction project of this four-level building on Boracay that will educate hundreds of children and adults needs these essential materials to be provided as one time gifts or as commitments every month until the building project is finished. Thank you to all of you who have done so much already. Together we are helping to realize this dream and hope for hundreds of precious children and families. This we do for the cause of Christ! Dear Friends, We want to pass on some news about what is happening on Boracay. There have been some exciting new and challenging developments, and we are humbled by what we see God doing. Thank you for praying with us for the people of Boracay on this very crowded but beautiful island. God recently blessed the ministry with the discovery of an abandoned hotel right on the Southern and quieter end of the White Sand Beach! It had been vacant for the past 5 years, and with trash and Typhoon damage, the place needed a lot work. But God is good! Through donations and a small but dedicated work crew, we fixed up this ‘once upon a time’ hotel. 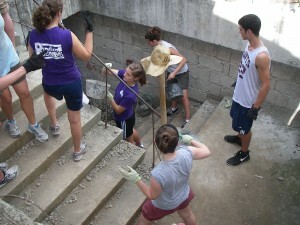 We are now using it to house short term mission teams who come to volunteer in the ministry. It has three large downstairs rooms where multiple bunk beds have been placed, and five smaller rooms upstairs for private use or sharing. 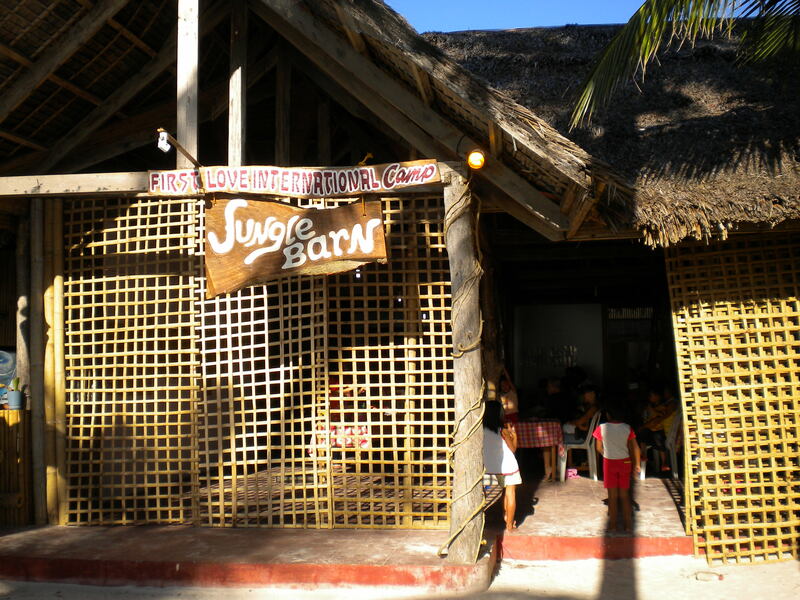 Because a part of the hotel was once called the “Jungle Bar”, we have now renamed it as the “Jungle Barn” – First Love International Camp. The hotel and bar has been transformed into a place where God can be glori\fied! It has been a wonderful blessing for all those who have come to serve on Boracay. By being right on the beach, the groups can watch the sunset right from the bamboo lounge chairs. Recently international high school students from Hong Kong, Korea, and Taiwan were all able to stay here, as well as single Americans who have come to volunteer. Maybe you’ll be next !? View from the Jungle Barn…. Another blessing of being right on the beach, is the ministry exposure. Vacationers hanging out on the beach see all of our groups in their red shirts and wonder what we are doing. We are then able to witness to them about the poverty on the island and share with them the ministry work at the feeding sites. Through their curiosity, some have been joining us! Below are Chad (from California), Marcelis (from Norway), and Gabriel (on leave from Army in Iraq) helping at a feeding site. They jumped right in, God Bless them! 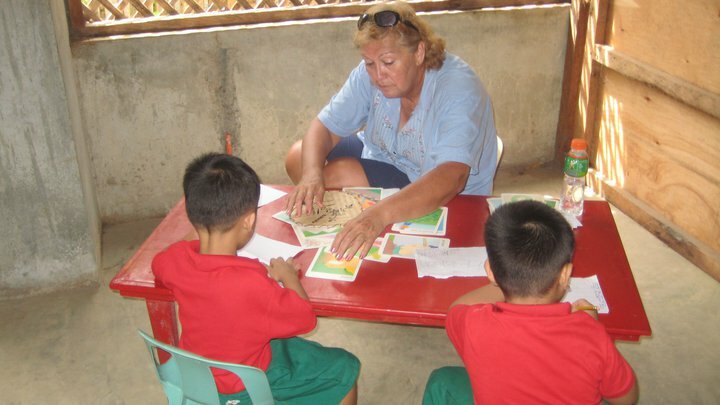 Quality education continues to be a problem in Boracay. Public schools have 60+ students per classroom. Private schools are expensive, and the education is not that much better. Many children don’t even go to school. Children are slipping through the cracks and not receiving the education they need. But God is Good! With the new Ministry Center construction on-going, we will be starting Pre-School in June on the ground floor! We have 55 students enrolled already and the parents are very excited about the affordable, private, Christian-based education. More grades will be gradually added and parents can’t wait. The new school, “Agape Boracay Academy (ABA)”, will have no more than 30 students per class, with teacher assistants in each classroom. Private schools average about US $50 per month. 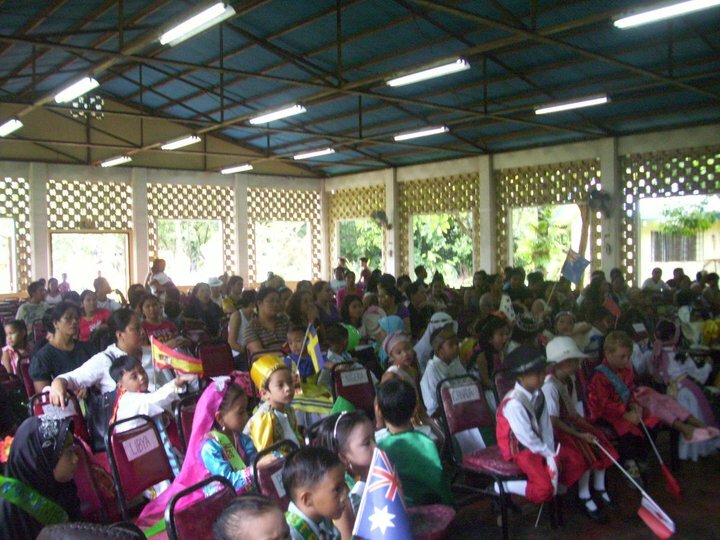 This school, US $5 per month. 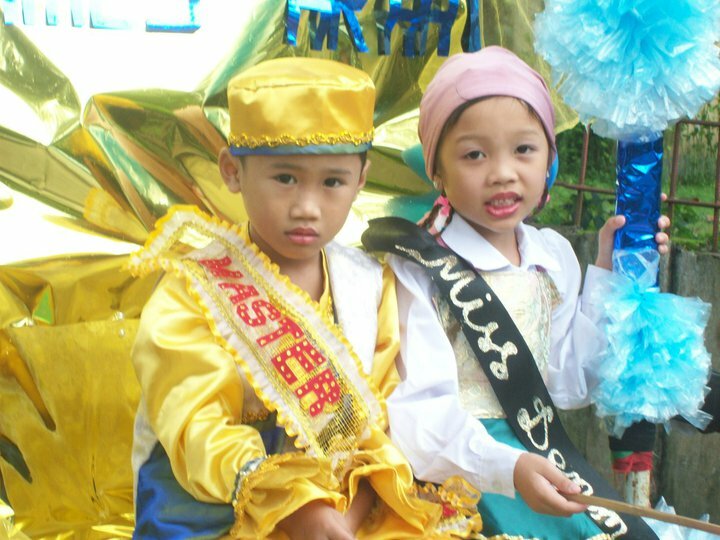 What a blessing this quality, affordable, education is to the impoverished families of Boracay. Enrollment day at the Jungle Barn…. A great ministry tool to share the Gospel of Jesus are Salvation Bracelets. They are a simple way to explain Heaven/God (gold), but because we are all sinful in nature we are separated from God (black). When we are washed in the Blood of Jesus (red), we are cleansed from sin (white), and can now grow in Christ (green). When we minister at School Visits and Sports Ministry, we hand these bracelets out as a remembrance of what our Lord Jesus has done for them. The students are always very grateful to receive the bracelets, and are very open to hearing and receiving the Word of God. In the past, we were purchasing these bracelets from an outside source, but now we are having them made right here on Boracay. One of our wonderful Ministry staff workers, Virginia, has been teaching the mothers at the feeding sites how to make the bracelets. We pay the mothers 5 pesos a bracelet (which is about US 10 cents). The people on the island are then able to make some extra money and we are able to have a multitude of bracelets to hand out and use for evangelism. In about 2 weeks after learning how to make the bracelets, 6 adults from one feeding site made 960 bracelets! Which gave them an income of 4800 pesos (US $109)! Not bad considering the average daily wages of most islanders is about US $5/day. What made this really special, is that 2 of the people who made a majority of these bracelets was a married couple. The husband had just lost his job and had no income. What a great blessing this was for them to have an opportunity to have an income! 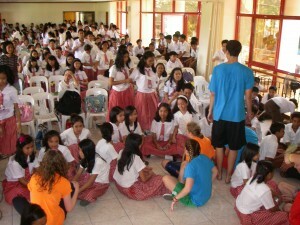 This past March, we had 45 students and teachers from Hong Kong International School in Boracay helping the ministry. How willing they were to jump in and help wherever needed! They helped with construction of the Ministry Center, community service clean-up projects, teaching and playing with the children at feedings sites, and interacting with Filipino students at public High School visits. The school visits were a wonderful opportunity for these international students from Hong Kont to interact with the Filipino students. The Hong Kong student taught them some Chinese, shared about life in Hong Kong, sang their favorite songs, danced a little, played games, and just had fun getting to know each other. We also were able to share about the Salvation of Christ with the students and give them all salvation bracelets as a remembrance, which the Filipino students loved. 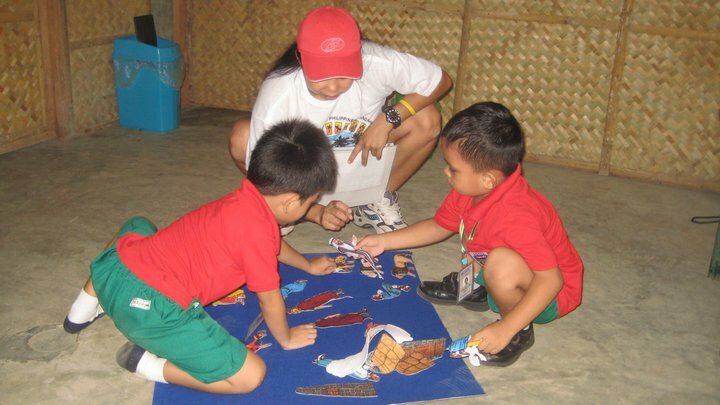 In fact, the Hong Kong students connected so well that many of the Filipino students came to the Jungle Barn to visit them in the evening. One Feeding Site Has it All! 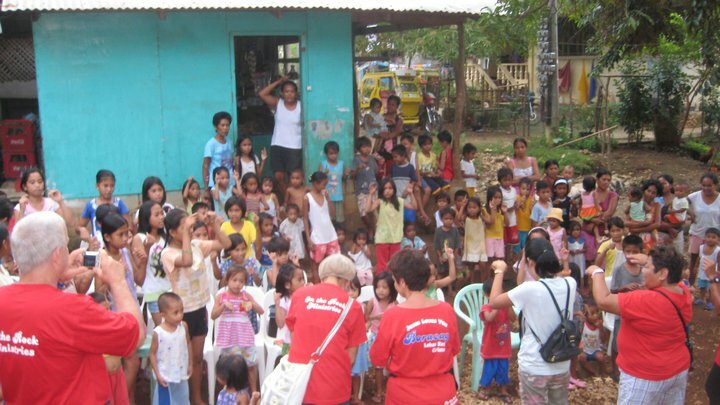 The Boracay Island ministry now has 18 feeding sites spread out all over the Island! With love, compassion, food, vitamins and medical attention for the children, the ministry is reaching out at 2-3 sites every day. With all these sites, this children’s ministry outreach needs sponsorship support more then ever before. There is one site that is fully sponsored! That is the Vargas site. For over a year now, a wonderful lady, a Boracay resident (originally from Holland) has been buying and preparing the food for the Vargas feeding site. Last summer, she had a couple friends come and visit her from Holland. When she took them to the feeding site near her home, her visitors were so moved with compassion that they made a decision to start a Foundation back in Holland to send financial support….and they did just that! Through their foundation, and their professional soccer player son, they have raised funds to complete the construction of the shelter, purchase toys, a big toy box, provide a chalk board for teaching, and provide new clothes and flip-flops for the children. They have been such a blessing to the children of Vargas! Would you join with others and pray for the ministry and people of Boracay? 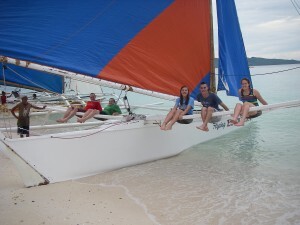 Visit and join on Facebook page Boracay Island – On the Rock Ministries. Psalm 97:1 The Lord Reigns, Let the Earth Rejoice, Let the Many Islands be Glad! How often do you turn on the TV when you are bored? With the flip of a switch, we can be instantly amused or engaged in one of many televised programs. Media has advanced a long ways since the original dramatized airwaves that first came from a radio, when one could listen to vocalized mysteries. Those kinds of radio dramas are perhaps even obsolete in the United States, but for many who cannot own a TV in the Philippines, radio dramas are still broadcasted for interested followers. On the crowded island of Boracay there are a lot of people who do not have a television or even a radio. Nevertheless, there are villages of people who huddle around a community radio in a neighborhood of homes and intently listen to the Filipino dramas that are regularly aired from Kalibo, a large city about 60 kilometers away on the next island over. Even in this day of advanced media technology, they are enamored over the radio’s simple dramas broadcasted in their Tagalog language. What if we could replace the radio drama broadcasts with something better? Enter The Proclaimer! With the cultural and literacy challenges that are presented on Boracay, many villagers’ lives are being changed because of the Proclaimer. The Proclaimer, an audio digital player, is so effective because it transmits the Word of God in an unusual manner that touches the hearts and minds of the Filipino. Because of the simple island lifestyle, this device is reaching the aged, the blind and the illiterate. Even the children listen intently to the animated voices which portray the characters from the Bible. Moreover, with electrical insufficiency, this device is self generating with a wind-up mechanism and a solar panel to continually recharge the battery. Wind it up by hand or set it in the sun and you have instant listening! With a quality digital speaker, The Proclaimer is powerful and far reaching. When one of our staff turns it on at a Bible study site, there are those living nearby who do not regularly attend the group study; but upon hearing the intriguing animated voices, they are suddenly becoming interested! With its strong compelling transmittal, The Proclaimer reaches well into surrounding homes, and they are unexpectedly captivated, by God’s Word. We are finding that The Proclaimer can and is taking the place of the radio. This effective tool for evangelism is not only being used in the community Bible studies and house churches, we are setting it at the building site, where the construction of the Ministry Center is taking place. As they work, the construction workers are happily listening to God’s word. May God’s Word continue to be absorbed into minds and hearts. We praise God for the gift of the Proclaimer. 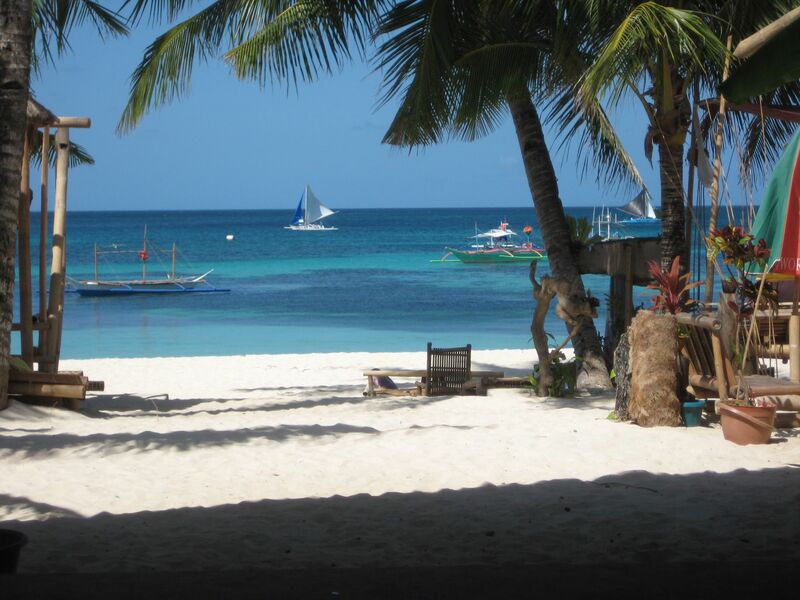 We want to give you a brief glimpse of what is happening on Boracay. 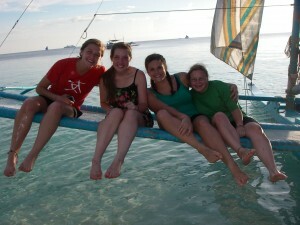 The Boracay ministry staff ministers to so many people in so many ways. The following testimonies represent only a part of the ministry that God is using to touch and shape lives here on the island. If not for God using our faithful ministry workers and you, this baby and teen would most likely be dead by now. The following are testimonies of saving just two lives, but there are many more cases going on right now, children and adults who are being medically treated. One month old Scarlet was listless in her mother’s arms, as her mom approached us at the Diniwid feeding site. It seemed that tiny Scarlet would not be able to fend off the blood infection that was consuming her precious little body. Scarlet’s mom explained to us that she did not have money to get treatment and medicine needed for Scarlet to get better. Without hesitation, we urgently took Scarlet and mom to the hospital. If there was no ministry, if there was no feeding site in Diniweed, what would have happened to Scarlet? Scarlet is now a very healthy baby. Fifteen year old Val seemed he might only survive for a few more days. His body was severely swelling, as he lay bed-ridden on the matted floor of his family’s nipa hut. Jimer and Derek, one of our volunteers from Hawaii went to his house. When Derek saw the condition of Val, he was moved to immediately make it possible to get Val to the hospital in Caticlan. At the hospital emergency, Val was diagnosed with a kidney infection and hemoglobin deficiency. As he was nursed back to health in the hospital, Derek and Jimer made several trips to the hospital to monitor his progress. God sent Jimer and Derek at just the right time to save Val’s life . If there was no ministry, no outreach to the hurting people on Boracay, what would have happened to Val? Today, Val is home from the hospital and out of danger. All over this very crowded island, we continually find critical medical needs; like those of Scarlet and Val. 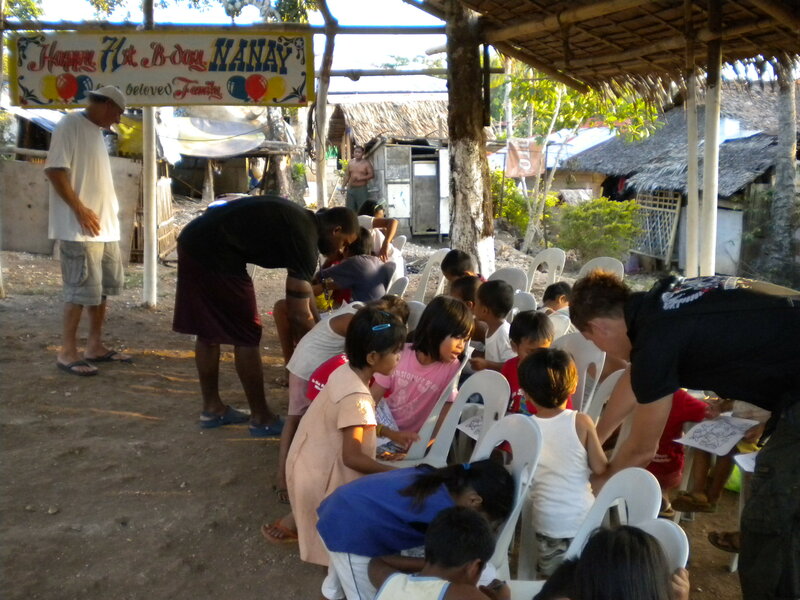 Right now the Boracay ministry staff is treating and caring for 24 more children and adults. There are more cases of sick infants, children, teenagers and adults who can not afford a simple doctor’s visit or needed hospital treatment. How can we ignore those who are sick and can not afford help? Medical treatment is so very inexpensive in this country, yet so many on the island do not have the money to pay for it. Many have been on the verge of death, but many have been rescued because of caring hearts. Like Derek, there are those of you who have come and seen these urgent needs first hand. We thank God for those of you who have felt the prompting of the Spirit to give for specific medical needs of people on Boracay. Not only have your dollars made bodies physically whole but in so doing, souls have also been rescued through the blood of Christ. Praise to our God for His healing power and the loving compassion from God’s family. PS. If you would like to know more about how you can help with the on-going medical needs of this ministry, please write to us at beaverbalita_seasia@yahoo.com. The story of Rolando and Teresa Atienza is a touching real life tale of a Filipino couple and their family, who left home and job and migrated to the island of Boracay. This is a moving account of the Atienza’s hardships and victories as they hold on to their passionate desire to develop a vibrant Christian church and ministry on Boracay Island. As a visual aid, this book calls on many people around the world to pray for and support the task that remains; to continue to reach the millions who have not heard the Gospel in South East Asia. If you would like to have a free copy of this book, please reply to luv4boracay@yahoo.com and supply us with your postal address. We will try to get you a book as soon as possible. Let us also know if you would like to order more than one copy.